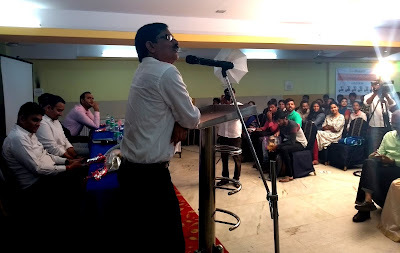 Ed-tech platform NeoStencil organised an IAS toppers seminar in Bangalore on 20th May. The seminar hosted their IAS students such as Suman Sourav Mohanty (All India Rank 9, 2016), Rishi Raj (AIR 27, 2017) an Akshat Kaushal (AIR 55, 2017) and a partner teacher Praveen Kishore, Director of Nice IAS. The seminar was attended by over 350 serious UPSC aspirants and parents. Attendees asked preparation related questions of all the speakers. Exam preparation in India has always been concentrated to a few cities. Top teachers in these cities have always been a valued commodity. With aspirants relocating to Kota for IIT/PMT, Delhi for IAS/IES and the like, as a norm. Many have tried to address this in different ways. Quite a few have set up VSAT centres, franchise in other cities. Some existing institutes have gone online with their own content. A few have created open online marketplaces while targeting to enable more than 10,000 teachers to come and teach. Despite these being around, more than 90% serious aspirants still continue to relocate to the same cities, to study from the same teachers. NeoStencil.com, an Ed-tech venture set up by IIT, AIIMS and IIM alumni, realized this pattern. And realized the core of the problem was never lack of quality teachers. The core was always accessibility to these quality teachers. NeoStencil decided to approach the problem differently. The company decided to enable existing top teachers of the country to conduct their classes online through its Live-Learning platform. To ensure that students saw value in this, and did not need to relocate any longer, NeoStencil conducts these classes Live. A student sitting in a remote corner of the country can attend a class by Hyderabad’s top teacher as and when the teacher is teaching in his classroom. So, the syllabus is up-to- date and current. Moreover, with live classes, student’s studying is in-sync with offline world and it is easier to manage the learning pace. If a student misses LIVE classes, he also gets the flexibility to attend the class later, 24x7 and any number of times. Study material, regular tests, toppers seminar are other features of this comprehensive one-stop platform of NeoStencil. This allows students around the country to get access to teachers of their choice, without needing to relocate any longer. Students can now continue with their jobs, continue living with their families. They do not need to spend lakhs on rent and living expenses. We take pride in the fact that we have been able to create a level playing field among aspirants as more than 50% of our students are from Tier III, IV towns and beyond with parental income less than INR 2.5 Lakhs – who otherwise couldn’t have afforded to relocate to Delhi and aspire for their IAS officer dream. Also, women in our country need to take into account additional factors – such as safety – before deciding to relocate. With a platform like NeoStencil getting established, women do not need to compromise on safety at all, and can access best education simply through their laptops. Today NeoStencil has become one of the preferred online platforms for Civil Services exams aspirants as it grants access to top teachers and their classroom programmes across India, through its Live-Learning platform. NeoStencil has tied-up only with top teachers of their field. Teachers who have vast experience, and have delivered stellar results throughout are on-boarded through well defined criteria. The Company has partnered with the most recognized and trusted teachers and coaching institutes such as Prof Majid Husain, Pavan Kumar IAS, Lukmaan IAS, Mitrapal, Alok Ranjan, Rajnish Raj, Praveen Kishore, Venkat Mohan among 40+ Institutes from across India. A graduate of IITB and IIMC, Kush Beejal, the Co-Founder of NeoStencil, said “The cost incurred towards Exam preparation is not only the course fees, but also the dilemma of leaving jobs, and the relocation expenses candidates have to bear to move to coaching capitals. With technology evolution, internet penetration and affordable IT hardware at NeoStencil we have bridged the geographical challenges for student and teachers to facilitate comprehensive preparation of competitive exams and within affordable range. We aim to delink aspiration and affordability”. “Many students have started using online platforms, such as NeoStencil, to connect with teachers and select their classroom of their choice. We are super excited and happy that almost 1 in every 2 successful candidates is a student of our partner institute. 102 of our online students made it to the 2017 final UPSC list including AIR-5, AIR-9 and so on. This is a testimonial to the acceptance of our platform among serious aspirants and the quality of education we enable through our platform," shares, Beejal. As per the sources, the Edutech market is further pegged to have a potential to touch $1.96Bn by 2020 from current size of $247 Mn.